I love roses, don’t you? Believe it or not, I used to have 40 different varieties of hybrid tea roses in my garden when I lived in Phoenix. Now, I am perfectly happy with my 3 David Austin shrub roses. Technically, they aren’t my roses. They belong to my kids. The beautiful pink rose, above, is Abraham Darby, which belongs to my daughter, Ruthie. We planted these roses 3 years ago. You can read about our planting adventure here, “Three Little Roses – Ready for a New Home” and “Three Little Roses -Time to Plant” complete with rose planting guidelines and pictures of my kids when they were much younger – where does the time go? I must admit that I am really missing my daughter, Rachele, who is entering her second week of basic training in the Navy. Mr. Shakespeare Comes to a Tragic End…..
Alas, Mr. Shakespeare’s life has ended tragically. Sadly, it was a rather short life out in the garden. He was lovingly planted by my son, Kai, back in January. Next to him were planted his ‘brothers’ Graham Thomas and Abraham Darby. Back in January, my three youngest children were so excited to plant rose bushes in our back garden. 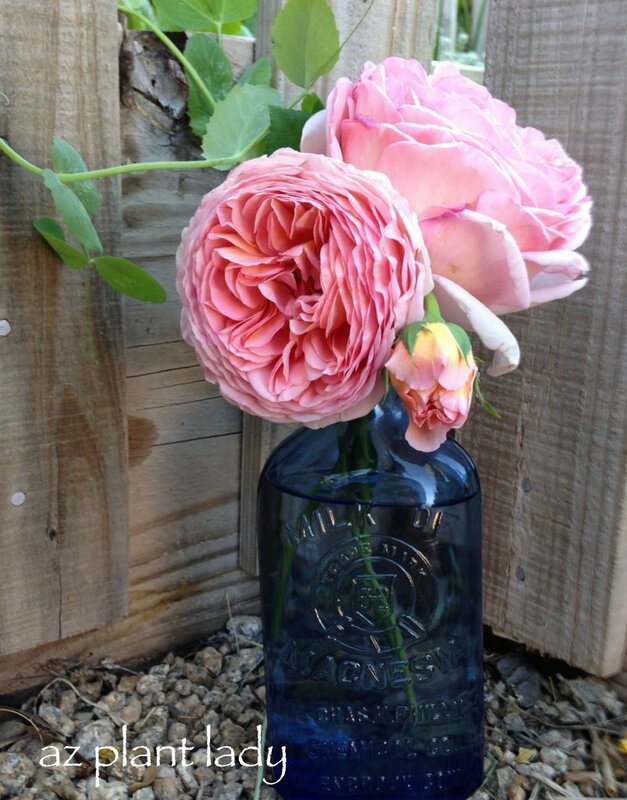 We selected three David Austin English Roses, based on our local rose society’s recommendations. All the kids pitched in in helping to dig the holes, amend the soil and plant the roses. Under the watchful eye of Tobey, who will play a part in Mr. Shakespeare’s story later, we planted all three roses. They were tiny, but we eagerly awaited the appearance of our first roses. Although, Mr. Thomas was in a hurry to bloom before his brothers, he bloomed before his stems were large enough to hold up his roses. Now Mr. Darby was not in a hurry and made sure he could hold up his flowers before they bloomed. While both Mr. Thomas and Darby were producing numerous blooms, Mr. Shakespeare did not grow as much as his brothers and made no efforts at producing any rosebuds. Then one day, my son came running in the house to tell me that he saw a single rosebud on his rose. He was so excited because it had been a little tough on him with both of his sisters having rose bushes with lots of blooms. We waited and waited for the rosebud to open and one morning when I went outside, there it was…. I rushed to take a picture of it and couldn’t wait for my son to come home so I could show him his rose. When he arrived home, we went out to the garden, but the rose was missing. Where could it be? There was just a stem sticking up where the rose used to be. Then, I noticed what looked like red confetti scattered on the back lawn. Well, it turned out to be rose petals. Guess what happened to the single rose? Here is the culprit – Tobey. Evidently, the rose looked like it was something fun to play with, because Tobey just bit it off and tore it up. My son, Kai, was disappointed but then decided he wanted to play football with his dad and promptly forgot about his destroyed rose. As for me, I lavished extra attention on Mr. Shakespeare, determined to make him produce more blooms. But my efforts were futile. Summer came and he went into summer dormancy, which is what most roses do during the summer heat – they just exist and stop producing blooms until fall. Last week I went out to water the roses and was happy to see Mr. Darby and Thomas doing very well. Then I turned my attention to Mr. Shakespeare and to be honest, I had to look closely to find him. If you can see a few brown sticks amidst the bark mulch and fallen leaves from last week’s storm – that is what remains of Mr. Shakespeare. I am not sure what happened to him…..he received the same treatment as his brothers but it did not seem to do any good. Sometimes there are no easy answers as to why some plants die and some survive. I am always telling this to my clients and now I am saying it to my son. **I hope you all have a great week. My kids are back in school and my life is getting back to normal. Today I am taking my first knitting class and my mom (Pastor Farmer of Double S Farms) is joining me. I can hardly wait! Do you remember when you were a child and couldn’t wait to grow up? First it was learning how to walk before you could run. Then learning how to ride a bike without training wheels. Later you become impatient, waiting until you are old enough to get your driver’s license, although that is often scary for the parents. Well, this is not a story about a child impatient to grow up. Rather, it is a story of a rose bush that is in too much of a hurry to flower. Back in January, we reintroduced roses into our garden. 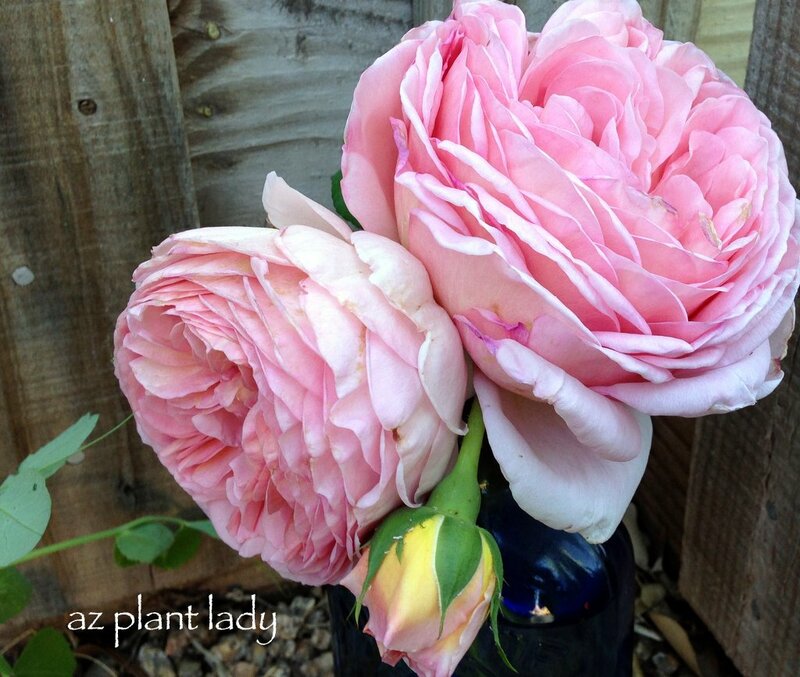 We purchased 3 David Austin roses – Abraham Darby, Graham Thomas and William Shakespeare. My children were so excited the day we received the roses in the mail. We prepared the holes using bone meal, bagged compost, blood meal and aged steer manure according to the directions from the rose grower. Once we planted them, they were so small, it was hard to even see them. Only two months later, we saw the beginning of a single rose bud growing on our Abraham Darby rose, which belongs to my third oldest daughter, Ruthie. We were all so excited and it seemed like it took forever for it to bloom. It was well worth the wait. I love the light pink of the petals and the fragrance was just intoxicating. Well, not wanting to be outdone by it’s neighbor, Abraham Darby….Graham Thomas decided that he would outdo Abraham. Almost all at once, he started to grow not just one rose bud, but 10! Now normally, I would be absolutely thrilled. I mean, who wouldn’t love all of these beautiful roses perfuming the air. But, there was just one problem. You can see part of the problem in the photo above. Graham had not grown big enough stems to support all the new roses, not to mention even one rose. And so, we had beautiful roses laying on the ground…. Hopefully, Graham will think twice about growing roses before he has big enough stems. Interestingly, our William Shakespeare rose is quite patient. He is rather puny and only formed his first rose bud a week ago. But, the stem should be able to support the rose (hopefully). And so the moral of the story is, do not flower until you have grown big enough to support them. I hope Mr. Graham Thomas has learned his lesson…. Okay, I realize that most of you have not been waiting with baited breath to see what three English Roses I have chosen. But for those of you who have, here is what I have decided on…. I owe a debt of gratitude to those of you who gave me excellent advice on the English roses that you have had success with. I also did some research by checking with my local rose society to see the rose varieties that do well in our area. Which leads me to an excellent tip – the ARS (American Rose Society) ratings are based on how each variety of rose grows all over the country. So, a rose that rated poorly in the northern areas may excel in the south. I highly recommend checking your local rose society’s information page online which should lead you to excellent rose choices for your area. You can find links to your local rose society by clicking here. Here is a link to the list of the best roses for the desert areas of Arizona. The location for my new roses are kindly indicated by my three youngest helpers. My new roses will receive bright morning sun, but will be protected from the intense afternoon sun in the summertime. *Notice my son’s right torn knee in his jeans. Why is it that all of his pants are that way? Only the right knee is torn on all of them… I have four daughters and my son is my youngest child, so boys are somewhat of a mystery to me. The small tree in the photo with my children, is of one of my favorite plants. It is blooming right now and even though I was taking pictures of where I was putting my new roses, I couldn’t resist taking this picture. I love that there are still plants flowering this time of year. In the meantime, I cannot wait to receive my new roses. I was not able to find English roses in any of our local nurseries, but I was able to find many suppliers online. I ordered mine through Heirloom Roses. They should arrive between January 6 – 10th. For those of you who would like to see how to plant roses, it is rather simple, but you need to follow certain rules. I will show you how once my roses arrive in a few weeks.